Here are the facts. The annual growth rate in C&I lending for March was just 2.4%, down from 6% in January. The growth rate was more than 13% in early 2015. Total outstanding C&I loans have hardly grown at all since October 2016. Essentially there’s been zero growth in the last three quarters. 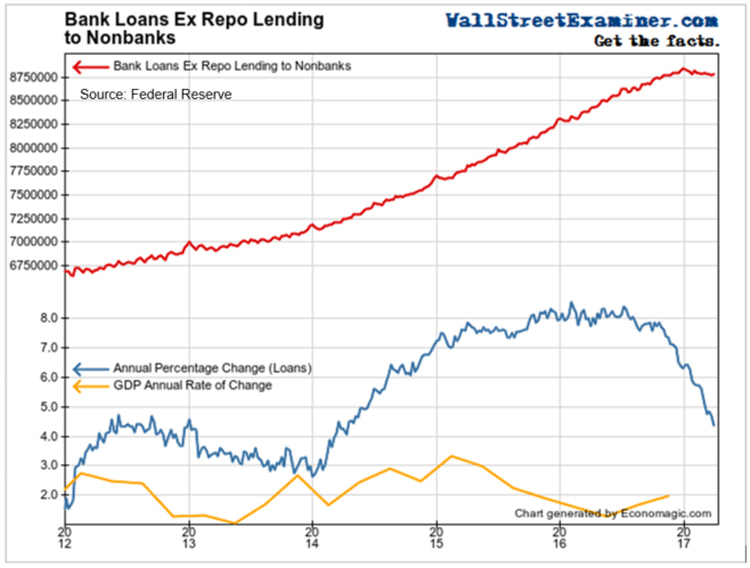 In the following chart, the red line is the total level of bank lending to non-banks not including so-called repo lending to the securities industry. As you can see, it has topped out and is beginning to trend down. The blue line tracks the year-over-year rate of change which is clearly slowing fast. 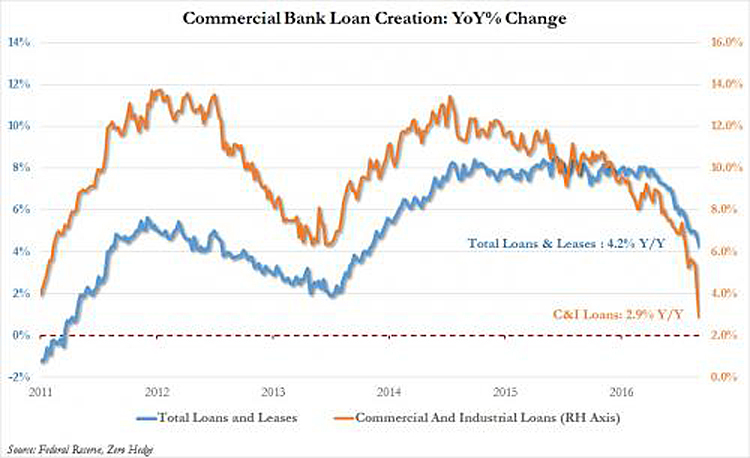 The following graph compares bank lending overall with C&I loans. C&I is leading the way down as businesses cut back on borrowing…not a good sign for the economy. Digging deeper reveals an even more distressing picture. The latest Fed Senior Loan officer survey shows that business loan demand has fallen sharply for small businesses as well as large ones. 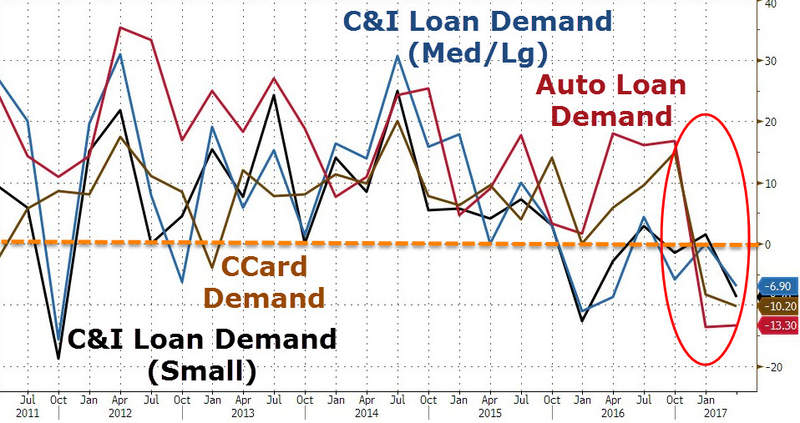 Consumers are also demanding less credit, with reduced levels of consumer, credit card and auto loan demand in the first quarter of this year. Demand for credit cards is now running at the lowest level in five years. The decline took place despite softer underwriting standards for credit cards which surprised analysts. 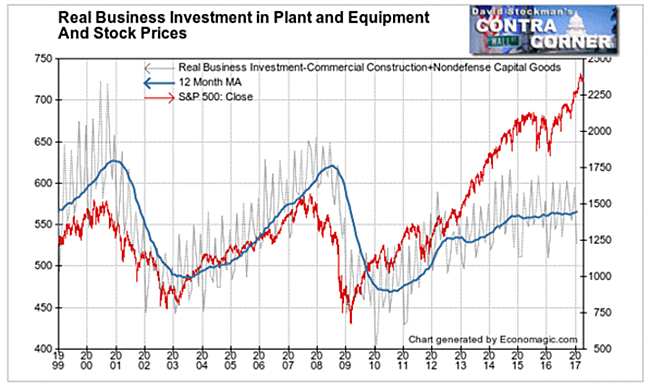 Meanwhile, as the stock market barrels higher, real business investment in plant and equipment has stalled (chart below). Bankers may be saying they are confident in their future prospects but the biggest customers of the banks apparently are not. Businesses essentially stopped growing their investments in tangible assets late in 2015. The result of the slow-down in lending growth is that the rate of increase in the money supply is also slowing. The chart below shows that the annualized three month rate of change in the US True Money Supply (TMS) has dropped precipitously since December of last year. TMS is the amount of money available for immediate use (not including money market funds which are really securities). 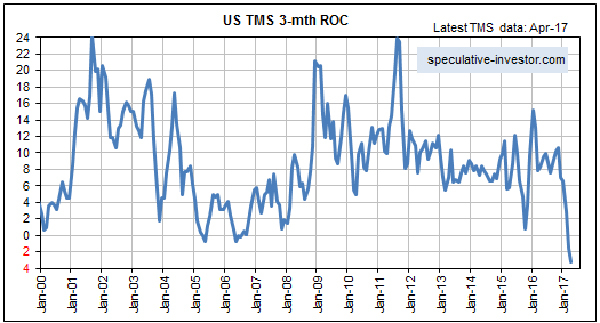 At the end of April, the annualized three month moving average of TMS was minus 3%, its lowest level in more than 20 years. As bank lending slows and with the Fed no longer engaged in Quantitative Easing, the money supply is tightening. This is not a reflection of Fed policy; raising the Fed Funds Rate as the Fed has been doing is not causing the shift in money supply growth. The slow-down in the economy is doing that. Whenever this has happened in the past, markets have done very poorly. Helmets on, dear reader. Previous Previous post: Major Move Coming?